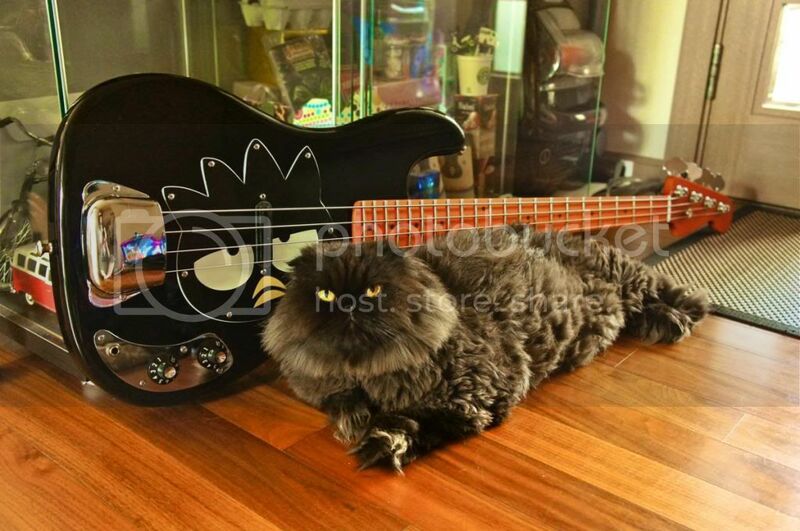 ShortScale :: View topic - Badtzision Bass UPDATE 2015: Jazz Badtz? 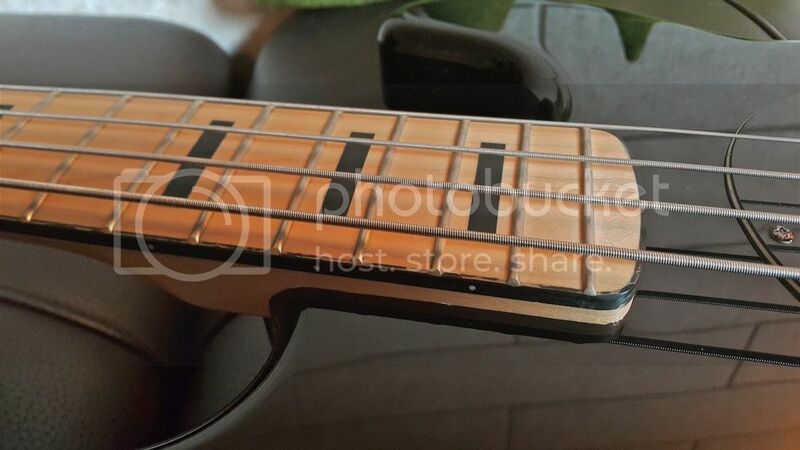 Badtzision Bass UPDATE 2015: Jazz Badtz? 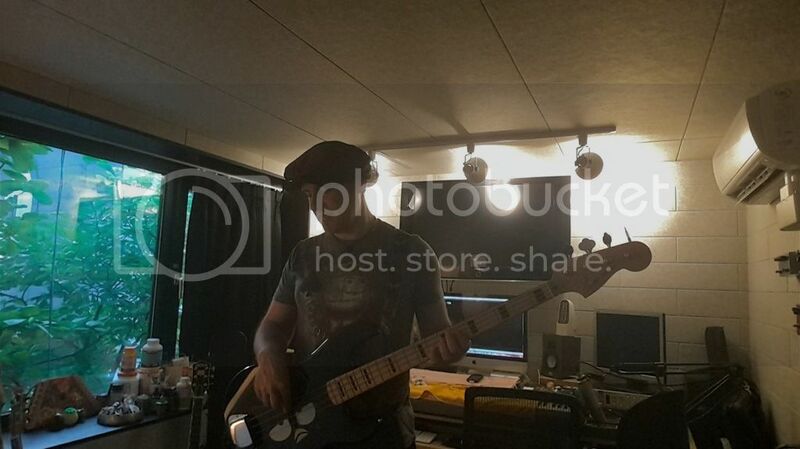 Posted: Tue Jun 11, 2013 1:25 pm Post subject: Badtzision Bass UPDATE 2015: Jazz Badtz? 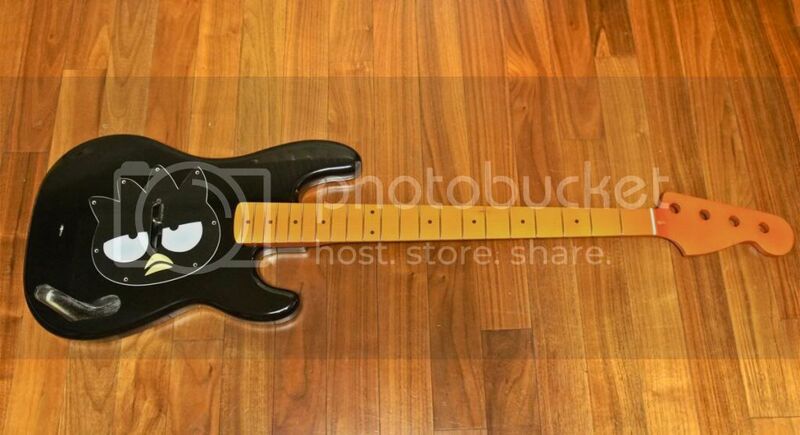 So it turned out that the Squier Badtz-Maru Bronco Bass' neck was warped beyond help, and even the skunk strip is fractured straight across. I was notified a tad late that our company's Spring stipend for Parent's Day (May 8th) had to be justified in our spending, so we had to suddenly come up with $500 in receipts to cover the bonus that just ended up in our accounts (sounds kinda weird, I know). Unlike our Christmas stipend that has to be spent on clothes (we usually take my Jeju folks to Uniqlo and spend it all there on them), our accountant said we could do whatever we wanted with it, and since we had no May purchases in written receipts and just a few days to come up with the paperwork, I got the green light from Cindi to blow a chunk of it at Willows, in the construction of the Badtzision Bass. Most parts were already either on the old bass or in my toolbox, so I had Willows do a satin-finished quarter-sawn amber tinted (more like Jersey Shore tan, see below) maple neck and 2-piece alder P-Bass body. Neck feels really nice, and the thing already has that tacky late '70s thing going on. Arrived this afternoon, $380 happily blown. Kent Armstrong Hot Blades, Grover tuners, Wilkinson bridge, P-Bass Eliminator control plate, Dunlop strap locks, Muddy Waters knobs and a mess of other things will be going on this weekend. Gonna be a blast to play, as silly as it looks. Just got a text message/MMS photo from trusty ol' Mr. Semoon Lee with the completed shot, just 24hrs after handing over the bag of bones. 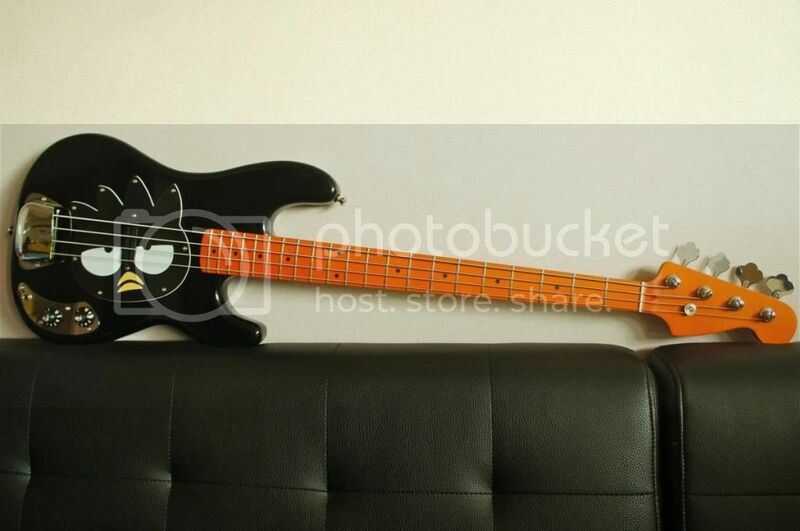 Granted, the original offset body was hot stuff, but I'm certain I'll have heaps of fun rocking out with this thing. Will pickup tomorrow and give a proper report. 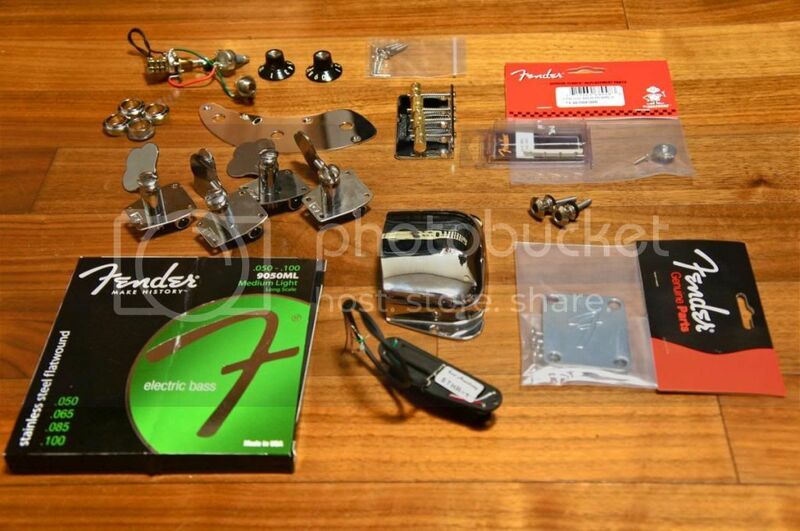 Just $45 for full drilling/assembly, nut cut, wiring of electronics, and proper setup. And he does darn good work every time. Aye, and I'm one post step ahead of you! S'all done as shown above, high-resolution close-up shots to follow ma�ana. GPR and Allparts both sell them: LANK. Hit it outta the park, hats off to ultratwin and Semoon Lee. 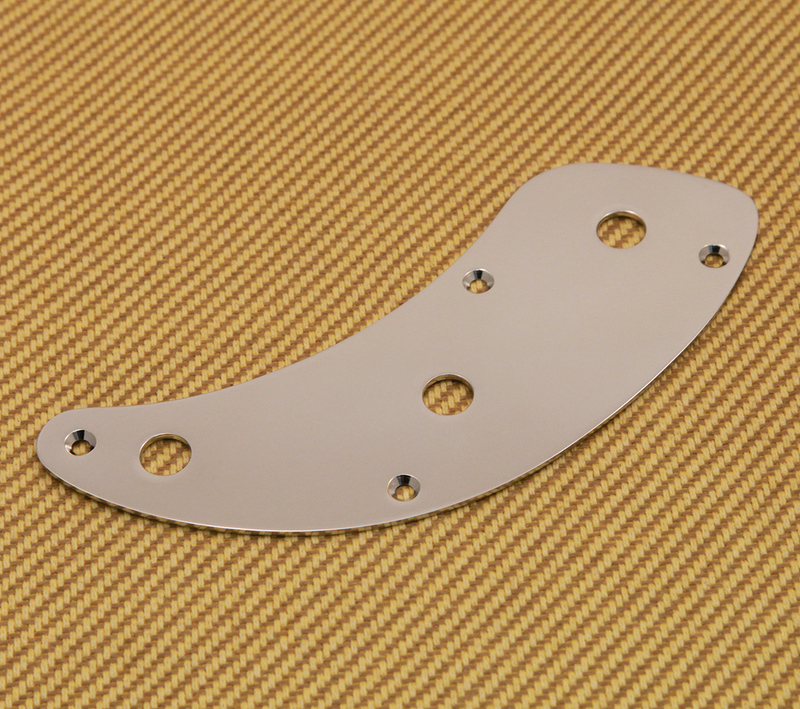 You need some black pickguard screws. You can pick up a bunch for next to nothing online. 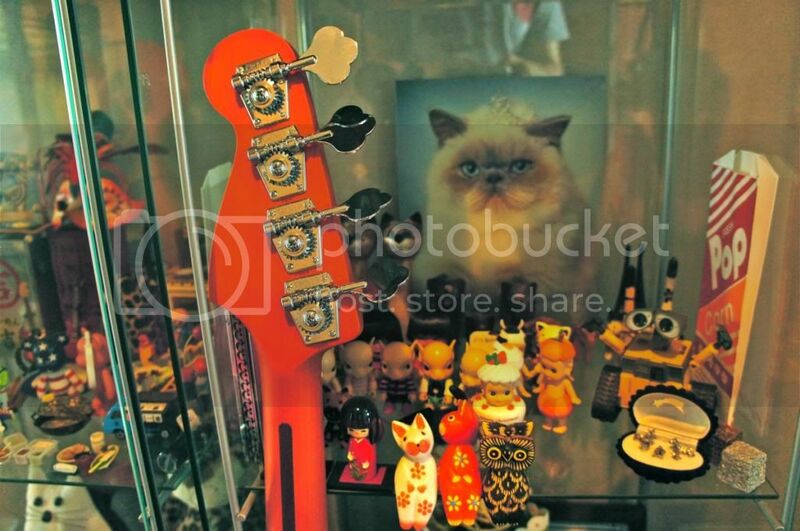 I've never played a 30" 4 string that I've got on with but I still want a Badtz Maru bass. Yeah, I agree that the aesthetics would be much improved upon. Dropped by the shop to pick it up this morning. Mr. Lee had some issues widening the plate to fit the oversized push-push pot and it barely covered the route, but otherwise it seemed to be smooth sailing. Plugged it in while there into his Twin Reverb and had a good run in the shop. Although I had the extra set of flats (as shown in the first post), I decided to go with medium light D'addarios for an easy going, somewhat brighter tone. As for teh toanz themselves, the humbucker sounds even beefier now that it's on the longer scale, and has all that meaty/midrangey punch I was hoping for. When split the brightness is cool, great for melodic picking and stuff. Fat Precision neck is fat, but it feels almost exactly the same size as my Peerless Smoked Custom and I'm sure I'll get used to it. Gonna have some fun in the studio come Monday. 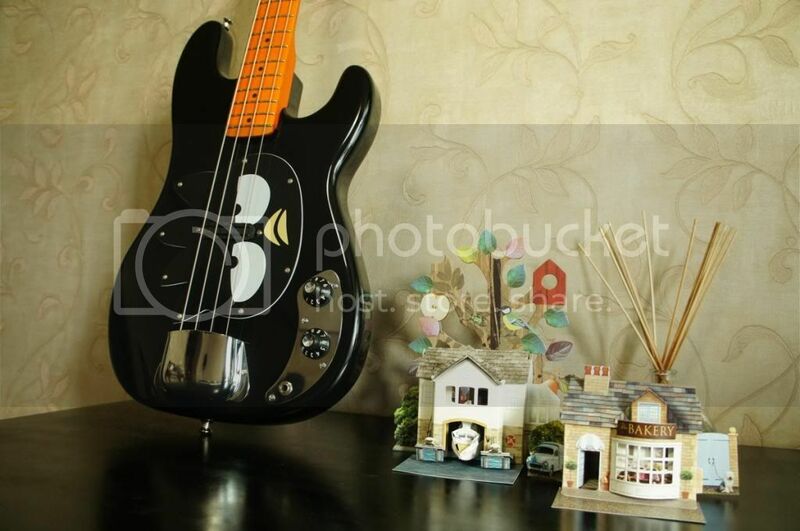 I'm sure some of you will agree that a proper 'Squier Precision Bass' decal will be the icing on the cake, though I have a feeling it may be next to impossible to find. Finish on the tinted neck seems to really vary based on the lighting. Sun indirectly shining through the bedroom lattice windows: '70s maple neck. Snooki spray tan under halogen. Up to now, I've felt all but invincible with my Moollon J-Classic and the above creation, essentially having all the toanz and so much more on tap and really with no need of anything in the thumpy dept (Hofner 500/1 on the way out, simply too uncomfortable and loaded with odd timbres to be used much). That all said, if any of you have taken a close look at my digits in person you might understand why the massive Willows Guitar neck I put on has been a bit daunting for my little girl fingers, and it was just my luck that a number of Vintage Modified 70s J-Basses have popped up recently on the cheap over here, enough to warrant a switch-out. Fast forward to a purchase from a young college student yesterday. With a disassembly and short-lived optimism I quickly noticed that these Indonesian builds have neck pockets/heels much wider than their developed-country-derived cousins (by a lot), and so the whole thing got taken to Mr. Lee's shop for fitting. 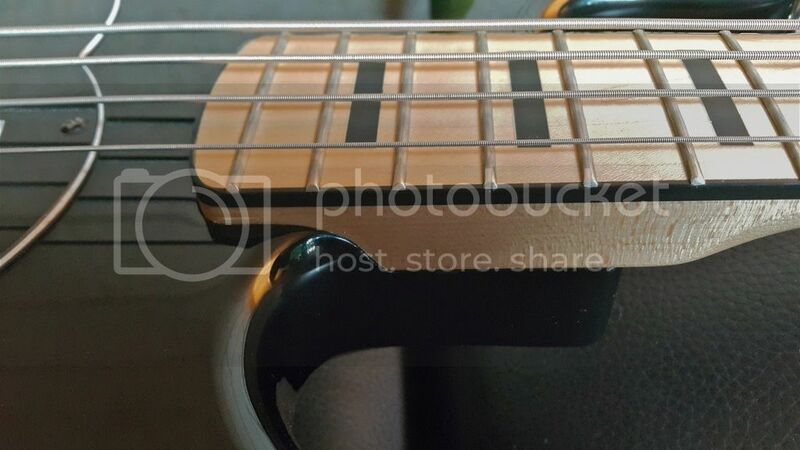 The very solid Grover tuners I have been using are easily switched over, but the body will have to be cut into to make room for the maple fun. And for the record, the neck is really nice, the satin finish is definitely thicker and slicker than the original "barely sealed" Bronco neck, and feels exactly like the '62 Jazz Basses I've messed about with. As an aside, the so-called "soft maple" body on this VM 70s J-Bass is really, really heavy...on par with the ash deadweight of my former '78 (if not heavier), now at Casa Fredo. Will likely sell it off as-is (along with the fatso Willows neck) to justify anything other vain splurges in the future, if I find a buyer or two. It's silly how much money has already gone into this mess, but my hands are crying out for the right combo. Pre-dissection at he home of the previous owner, the new creation will be done and posted probably by tomorrow evening. 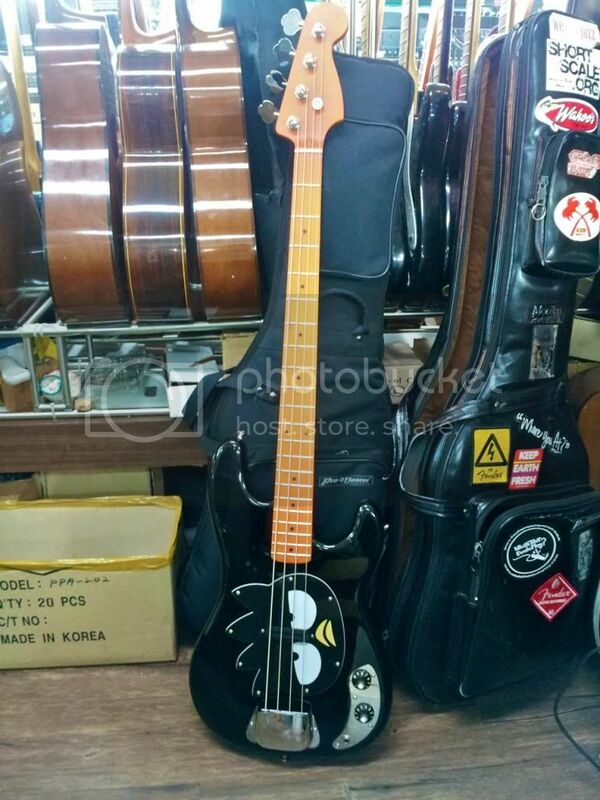 I arrived at work and minutes later got an image via Kakao Talk (and not a peep) indicating that the bass was completed. Neck pocket shaved on either end for the neck to fit nice and snug, neck holes filled and re-drilled to match body, string tree and Grovers installed, and fully restrung &setup for just $26. Dude, $26. Mr. Semoon Lee is a proper champ as always. Jazz neck looks and feels fantastic, and the surprising lack of weight compared to the massive cricket bat also means no more neck dive I had, although I kinda think that the bass' sustain before was a wee bit better with that hefty thing on. 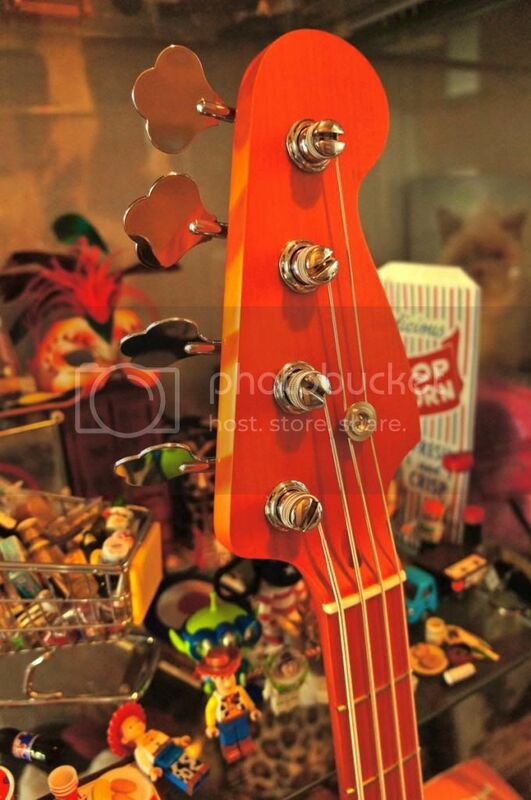 At any rate, happy to turn another page and have an even better rock bass in the collection, though all the expenses technically no longer "on the cheap". 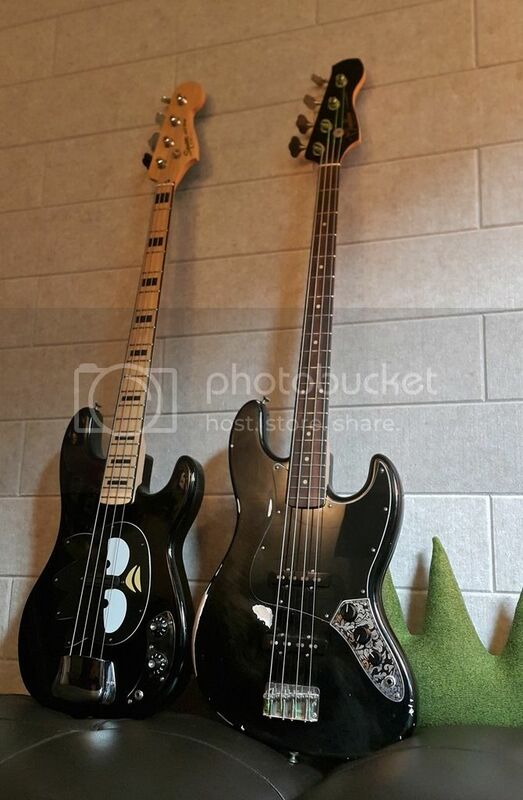 I've got two great basses and can cover all teh toanz. Still no black screws though.